In my last article, I voiced my concern over the impact to your portfolio of a stock market pullback. In the past three weeks, we have seen exactly that. The Dow Jones dropped almost 10% before retracting to 17,000. I suggested you balance your portfolio with an asset UNCORRELATED to market forces - rare gold coins. Unprotected investors are running to uncorrelated assets before it's too late. Many are having sleepless nights, but not ASI clients enrolled in the Rare Coin Program (RCP). ASI's RCP clients are prepared. The Rare Coin Program is one of our most successful programs, garnering hundreds of participants in a very short time. In fact, ALL of the coins featured in my last article are sold. Best of all, we have a variety of coins that will fit most budgets looking for diversification! Many of you are ready to buy, and I don't want to keep you in suspense. Here is a coin you can purchase right now. But, I must give fair warning; many of our coins were purchased within 24 hours of publishing my last two RCP articles. Veteran rare coin buyers were so impressed by what we offered, they bought as soon as my email hit their inbox. If you are interested, please call us at 877-340-0790. Have you ever wanted to own a coin that was the single finest known example of a truly rare issue? If the answer is "yes," then you will want to read about this 1866 with Motto half eagle. This is a numismatically significant issue as it is the first year in which Philadelphia half eagles were made with the motto IN GOD WE TRUST. Only 6,700 1866 half eagles were made for circulation, and it is believed that no more than 60 or 70 are known today, with most of these grading in the Very Fine to Extremely Fine range. There are exactly three known in Uncirculated, of which this specific coin is widely regarded as the single finest. This piece is choice for the grade with nice natural russet and rose colors, in different configurations, on the obverse and reverse. There are a few grade-limiting marks in the fields, but this piece shows great luster, strong overall detail, and great eye appeal for the issue. PCGS has graded just this one coin in MS62 with none finer, while NGC has graded one in MS63 (more on this in a moment). CAC has approved just this one coin in MS62, and no others have been stickered in any Uncirculated grade. The NGC MS63 1866 is a coin which was upgraded from its original MS62 holder. It has sold for as much as $40,250 in its first auction appearance in September 2008. 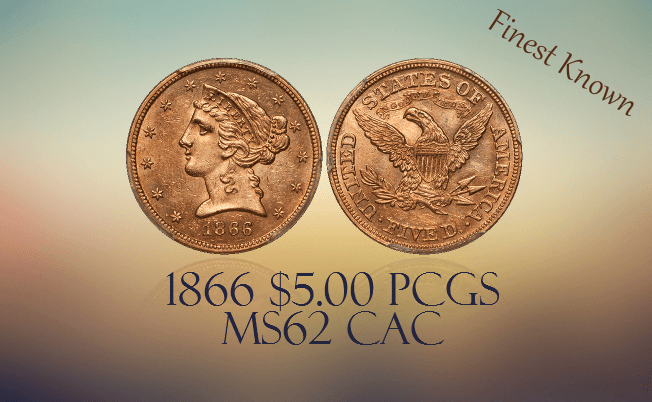 Experts who have seen both the NGC MS63 and the PCGS MS62 are unanimous in their belief that the latter coin is significantly finer, due to its original surfaces and superior eye appeal. If this coin isn't for you, visit our website to see more examples of hand-picked coins that may be perfect for you. These coins are a variety of price levels and are available right now! Rare coins have earned an average of 11% annually over the past 40 years. No stock market or investment index boasts such consistency. To have any hope for such returns, you need a turnkey buy/sell strategy with hand-picked selections by a leading world expert. Think of the rare coin equivalent of having Warren Buffet pick your stock portfolio. 2. Enough balance in your portfolio to protect you in case of market corrections in other assets. 3. Access to a collector driven market to supplement a core portfolio of precious metals for long-term holding. Who could fulfill all these goals for you? Only someone who eats, sleeps and thinks rare coins. Someone who has written over a dozen of the leading books in the field and is a contributor to some of the most famous U.S. coin reference guides (the 'Redbook' to name one). That someone is Douglas Winter, the world's leading expert in pre-1933 U.S. rare gold coins. Doug has been at the forefront of the rare coin business for the last 40 years and started collecting at age seven! He is one of the most respected names in numismatics and has been a lead consultant for Stacks & Bowers, Heritage Auctions, and Sotheby's, and lead buyer of rare coins for major firms. He knows the nuances of pricing, what is trending and what is valuable beyond its cost. Attention gold owners! The Rare Coin Program is your perfect addition for long term holdings. For veteran gold and silver buyers who want to protect their buying power from the devaluation of the dollar, the natural next step is rare coins. With both collector and investor demand rising, we offer rare coins in a variety of price ranges. When collectors are on a buying spree, they are also on a selling spree... selling lower cost coins to upgrade their collection. Doug will personally select coins in all price ranges for you and your budget. You can enter the RCP with minimums of $10,000 to start. While we can start as low as $10,000, the average portfolio is about $50,000, and we have found that those who start small, add to their portfolio in a big way over time. Those who are in the know love our program, and buy us out fast. Still, we want you to be educated and have clarity on how and why rare coins are selected. It all starts with a discussion of your goals with a Preferred Client Relations representative. We do not work on a commission basis. Our compensation is a fixed salary. Only when you are ready will we give our expert, Doug Winter, the go ahead to personally handcraft your portfolio. Your exit plan is built into the RCP strategy. When you are ready to sell or upgrade your portfolio, sell your coin back to us! Yes, we sold you the best and we are ready to buy it back! ASI and Doug will get the best price for you through the serious buyers with whom Doug works daily. You are never obligated to sell back to us, but there's a good chance Doug already has an investor or top collector to buy from you. If you already own rare coins, allow us to evaluate them free of charge and help you create a winning portfolio. If you are ready to buy the coins listed in this article or any of our other featured coins, call me at 877-340-0790 or send me an email.